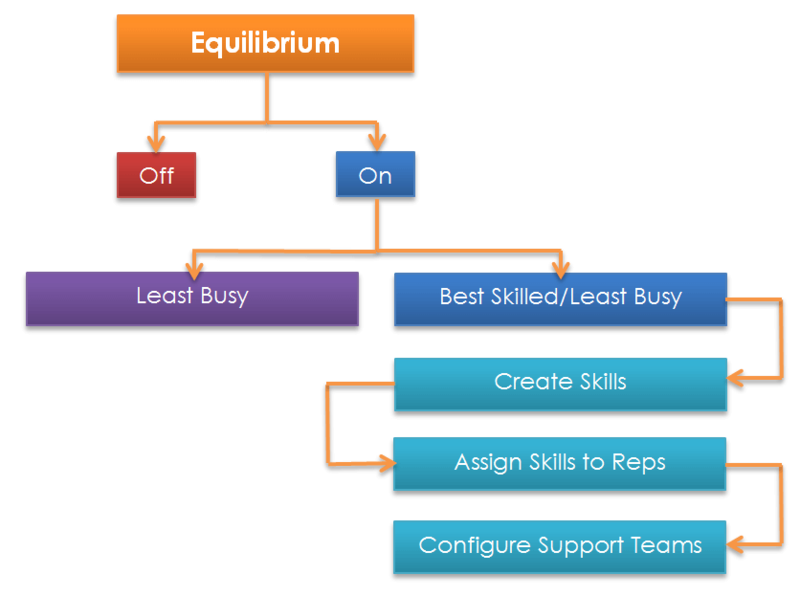 Equilibrium allows you to automatically distribute incoming support requests within a team queue. Depending on the algorithm selected, incoming requests can be assigned to the least busy representative or the best skilled/least busy to handle the support issue. If the “best skilled/least busy” algorithm is selected, when a customer starts a session asking for help with a “driver update”, for example, that session is routed to the representative best suited to handle this issue. If no perfect match is found, or there are no available representatives with that particular skill set, the algorithm running Equilibrium drops “driver” and look for “software updates” and try another match looking for the next best suited representative to handle “software updates”. The process continues until the best match is found or until all skill requirements are removed and the session is simply routed to the next least busy representative. With Equilibrium set up and support issues routed to the appropriate teams and assigned priorities, you can greatly increase support efficiency and reduce customer hold times, ensuring that sessions are handled by the best qualified representative in the most efficient manner possible. This document is designed to help you set up Equilibrium so that you can automatically manage how sessions are assigned to your representatives. Since there are several steps necessary when setting up automatic session distribution, it is advisable that you follow the flow process in this guide. The flowchart on the right shows how Equilibrium works and how it is configured.